Clark County School District: Latest News - PIE DAY!!! 3.1415926535897932384626433832795028841971693993751 and so on and so on! 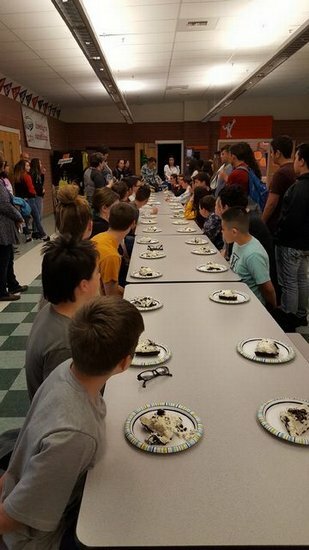 Every year when our traditional Clark County Pi Day comes along, it is not only about the Mathematical number, but also some good ol’ cookies and cream pie! YUMMY! Mrs. Wagoner and Mrs. Johnson were on hand to test students’ academic prowess by allowing them to recite as many numbers of Pi as they could remember, in the proper order, in front of their peers. The results: High School student, Nathaniel Baker was able to beat his last year’s record by reciting 151 numbers of Pi. Junior High student, Emmalee Stewart is making a name for herself by reciting 37 numbers of Pi! Totally SWEET!